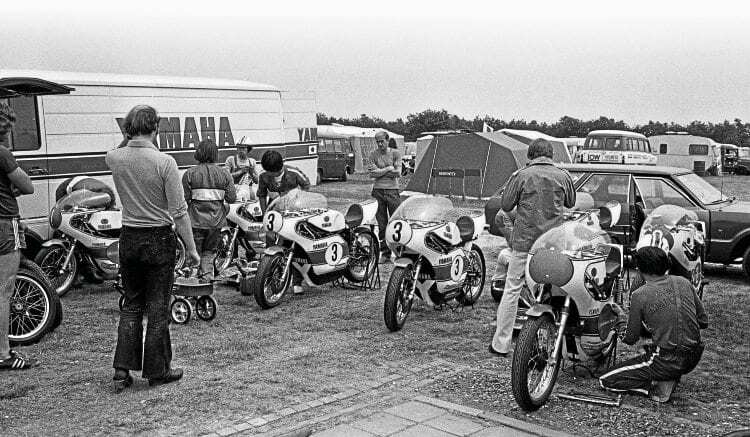 Over 150,000 race fans went to see the sixth round of the 500cc world championship at the end of June 1974. They were all eagerly looking forward to the battle of the fours between the MVs, Yamahas and Suzukis. Works Yamahas of Agostini and Länsivuori (350 0W16 and 500 0W20) being worked on in the open air, on the grass, in Assen. The Isle of Man TT results of early June had not changed the championship positions as the top title contenders had decided to give the fifth round a miss on safety grounds. Jack Findlay was the only rider who did start at the Senior, but he was out of luck and retired after holding third place on the second lap. Best result of a regular GP contender was Charlie Williams who scored a second place on a 351 Dugdale Maxton Yamaha. The Suzuki team was shocked by the news that their test riders Gary Nixon and Ken Araoka had both had a terrible accident in Japan testing a new RG500. Both riders were badly injured and it delayed the appearance of the modified four-cylinder machines that were ruined in the incident. In practice it became clear that the differences in speed were minimal between the Yamahas and MVs. Teuvo Länsivuori set the best time, Agostini was second and Phil Read on the MV third. Suzuki’s best was Barry Sheene on the last front row spot, just in front of his team-mate Jack Findlay who was even faster than Gianfranco Bonera on the second MV. Suzuki had signed up an extra rider, Italian Guido Mandracci, for their team. It became clear that Paul Smart who chalked up failure after failure wanted to leave the Grand Prix scene after the Dutch TT. “I have lost confidence and must have time to get things together again properly”, he said.